Ah, the songs youll hear, the tales you'll tell with this magical home that doesn't seem constructed so much as conjured. 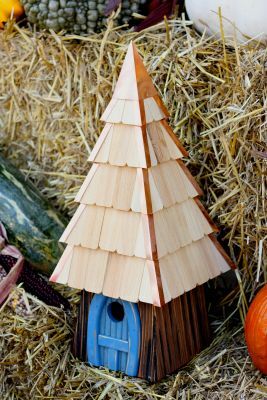 Bark-like rustic scored exterior is captivatingly quaint, topped with a shingled roof dotted with inviting earth tone colors. Dazzling door offers a choice of brilliantly bright hues: Blue, Yellow, Moss Green and Redwood. Old fashioned in all the best ways, including quality hand-craftsmanship rare in a mass-produced modern world. Lord of the Wing means years of hobbit-ual birding pleasure ahead. 1½" hole size.